Grew Up… in the great state of New Jersey. Nucky identifies himself as an “Irish Catholic Jersey boy.” As a child, Nucky was physically abused by his father and lost his sister at a young age to tuberculosis. 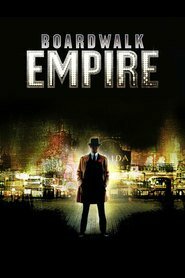 Growing up in hard times has helped Nucky appreciate the boom that he’s currently living in as a major player in Atlantic City’s criminal underworld. Living… in Atlantic City, N.J., a beautiful seaside city famous for its entertainment, beautiful boardwalks, and free-flowing liquor. Nucky doesn’t only live in Atlantic City; in a way, he is responsible for creating the city, for making it the great place that it is today in the Roaring ‘20s. Interests… drinking and socializing. Nucky is famous for being an epicurean of sorts. He earns a lot of money and is not shy about spending it on wild parties, decadent meals and luxurious houses and cars. Relationship Status… single, though looking. Nucky was married once before, but his wife and infant child died. As a wealthy and powerful single man, Nucky is certainly enjoying himself, but there’s a part of him that wants something deeper, something stable. Challenge… defeating his rivals and outwitting the law.His first order of business is circumventing the Eighteenth Amendment, which has outlawed alcohol. As he tells the city’s (corrupt) Mayor: “Rest assured that dry as though the county may be, I am in the midst of concluding arrangements that will keep Atlantic City as wet as a mermaid’s [privates].” The real challenge isn’t getting the alcohol, it’s keeping it out of the hands of other gangsters while also avoiding traps set by Agent Van Alden and the FBI. Personality… it depends. Nucky the politician is kind, caring, understanding and charming, and he can be very loyal and generous to his friends and family. Nucky the gangster, on the other hand, is a ruthless killer bound on crushing his enemies and keeping his place on Atlantic City’s throne. Nucky Thompson 's popularity ranking on CharacTour is #2647 out of 5,000+ characters. See our top-ranked characters and read their profiles.